I used a 1995 Ben head, "hooded" Ben chest, and Ep. I Obi Wan Naboo arms, robe, pelvis, and legs. I trimmed the plastic skirt from the belt and glued on some fabric. 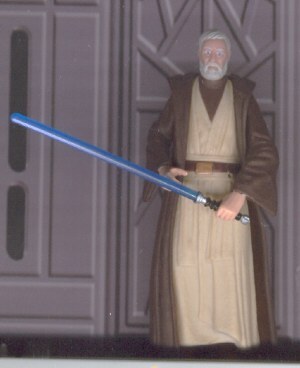 This is my second version of "old" Ben Kenobi. For this one I used POTJ Ben Kenobi and the robe from Naboo Obi-Wan (the same one from the first version). I put the robe on Ben's body, and trimmed the bottom of it to make it the right length. The shadow from my scan hides the cut in the photo. I then painted the arms and robe dark brown. When the paint dried, I gave the arms and robe several coats of Testor's Dull Coat.